Home / Dissent NewsWire / ﻿ICE Agents are Torturing Detainees in Their Custody. ﻿ICE Agents are Torturing Detainees in Their Custody. It’s no secret that conditions at ICE detention and processing facilities are deplorable. Long waits for bond hearings, lack of medical care, verbal abuse and worse from guards have all been documented. Advocates say that as many as 30 asylum-seekers held in ICE detention are on hunger strike to protest these conditions and their unjust detention. In response, ICE officials in El Paso, Texas are force feeding nine of the men through nasal tubes and IV. The force feeding tube stays in their nasal passages 24/7. On some of the individuals the tubes are too large, causing nasal bleeding and unnecessary pain. Many of the detained asylum seekers have wounds and lesions on their throats and nasal passages, and are having difficulty speaking and breathing. We are deeply concerned about their health and well-being. 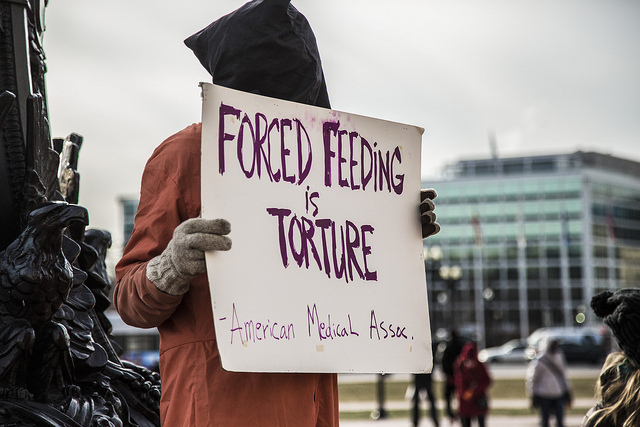 The United Nations Special Rapporteur on Torture has called the force feeding of detainees who go on hunger strike against their conditions as “tantamount to cruel, inhuman and degrading treatment.” The World Medical Association has forbidden its members from participating in such practices and the American Medical Association has condemned the practice. Take action to stop this cruel practice at ICE! International human rights and medical ethics experts have repeatedly condemned force-feeding hunger strikers, whether at Guantanamo, in Northern Ireland, Israel, Moldova or elsewhere.